Nephrogenic diabetes insipidus (NDI) is caused by impairment of vasopressin (VP) receptor type 2 signaling. Because potential therapies for NDI that target the canonical VP/cAMP/protein kinase A pathway have so far proven ineffective, alternative strategies for modulating aquaporin 2 (AQP2) trafficking have been sought. Successful identification of compounds by our high–throughput chemical screening assay prompted us to determine whether EGF receptor (EGFR) inhibitors stimulate AQP2 trafficking and reduce urine output. Erlotinib, a selective EGFR inhibitor, enhanced AQP2 apical membrane expression in collecting duct principal cells and reduced urine volume by 45% after 5 days of treatment in mice with lithium-induced NDI. Similar to VP, erlotinib increased exocytosis and decreased endocytosis in LLC-PK1 cells, resulting in a significant increase in AQP2 membrane accumulation. Erlotinib increased phosphorylation of AQP2 at Ser-256 and Ser-269 and decreased phosphorylation at Ser-261 in a dose-dependent manner. However, unlike VP, the effect of erlotinib was independent of cAMP, cGMP, and protein kinase A. Conversely, EGF reduced VP–induced AQP2 Ser-256 phosphorylation, suggesting crosstalk between VP and EGF in AQP2 trafficking and a role of EGF in water homeostasis. These results reveal a novel pathway that contributes to the regulation of AQP2–mediated water reabsorption and suggest new potential therapeutic strategies for NDI treatment. Our previous study found that AG-490, a combined EGF receptor (EGFR) and JAK-2 kinase inhibitor, increased AQP2 membrane accumulation and increased water reabsorption in rats.16 The idea that EGF may play a role in water balance was previously suggested by Gow and Phillips,17 because they showed that EGF infusion in sheep resulted in brisk diuresis and natriuresis. Therefore, we used erlotinib, a Food and Drug Administration (FDA) –approved EGFR inhibitor,18,19 to study the underlying pathways affected by EGF inhibition in water balance. In this study, we found that EGF indeed plays a role in water homeostasis. 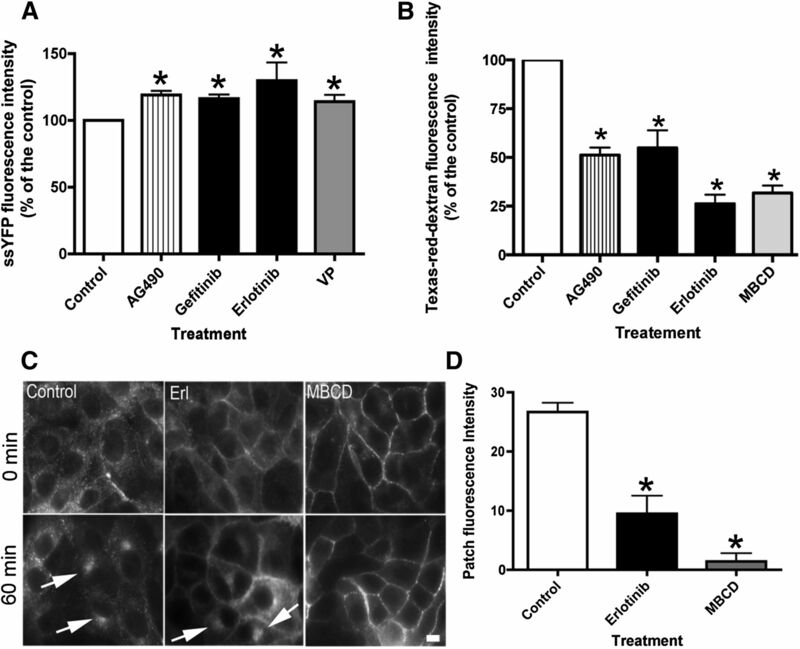 EGFR inhibition by erlotinib increased AQP2 membrane accumulation in mouse kidney principal cells and ameliorated lithium-induced NDI. It stabilized urine output and increased urinary osmolality significantly but without affecting the canonical VP/cAMP/PKA pathway. Our findings have uncovered a novel pathway not previously known to interact with AQP2 trafficking and identify potential therapeutic targets for NDI. AQP2 localization shifted from the cytoplasm to the plasma membrane after VP treatment of LLC-PK1 cells stably transfected with AQP2 (LLC-AQP2) as previously described (Figure 1A).20,21 A similar pattern was observed with AG-490, a combined JAK-2 and EGFR inhibitor. The role of the JAK/STAT signaling pathway was ruled out, because TG-101348, a selective JAK-2 inhibitor, did not induce AQP2 membrane accumulation. In contrast, specific EGFR inhibitors, gefitinib and erlotinib, led to a significant accumulation of AQP2 at the plasma membrane (Figure 1, A and B). These results suggest a crosstalk between EGFR signaling pathways and AQP2 trafficking and prompted us to continue the investigation in vivo using a lithium–induced NDI mouse model. EGFR inhibitors, but not a JAK kinase inhibitor, increase AQP2 membrane accumulation in LLC-PK1 cells. (A) LLC-PK1 cells stably expressing c-myc–tagged AQP2 (CT) were treated for 30 minutes with inhibitors. After incubation, cells were fixed and stained using anti-c-myc antibody. AG-490, an EGFR and JAK kinase inhibitor, induced an increase of AQP2 membrane staining. Similar results were observed with more selective EGFR inhibitors: erlotinib (2 μM) or gefitinib (1 μM). No AQP2 membrane staining was observed in cells treated with TG-101348 (0.2 μM), a selective JAK kinase inhibitor. Cells treated with VP (10 nM) were used as a positive control. These images are representative of three independent experiments. Scale bar, 10 μM. (B) The confocal image quantification showed that all treatments significantly increased AQP2 membrane expression, except TG-101348. P values were assessed by using the one–way ANOVA Tukey test (mean±SEM; n=3). *P<0.05 versus control; #P<0.05 versus TG-101348. 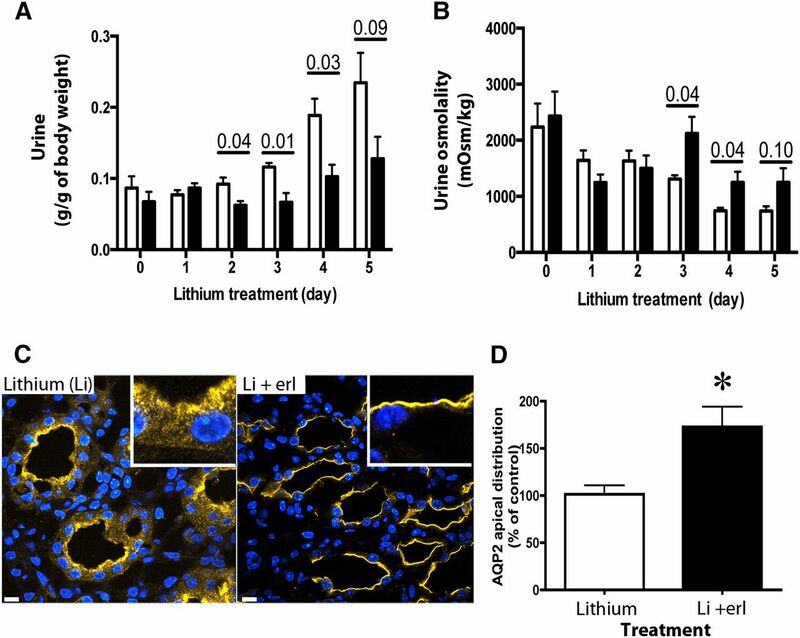 Erlotinib reduces urine volume and increases urine osmolality in lithium–induced NDI mice. Mice in metabolic cages were fed with lithium to induce polyuria. On day 0, one half of the mice were randomized to receive 100 mg/kg erlotinib in addition to lithium (black bars). White bars represent mice that received lithium only. (A) Urine volume and (B) osmolality were analyzed (mean±SEM; n=4 pairs or n=8 mice per treatment). Data were analyzed using multiple comparison t tests and Bonferroni post-tests. (C) Immunostaining of AQP2 showed an increase of AQP2 in the apical membrane of principal cells of erlotinib-treated mice compared with untreated mice. (D) Apical membrane fluorescence quantification showed an increase of AQP2 at the apical membrane of principal cells in erlotinib-treated mice (black bar) compared with untreated mice (white bar). Quantification represents an average of 30 kidney principal cells from three mice (mean±SEM; n=3). *P<0.05 (t test). The effect of EGFR inhibitors on AQP2 exocytosis and endocytosis was investigated, because we have shown previously that AQP2 recycles constitutively between intracellular vesicles and the plasma membrane and that blocking endocytosis alone results in AQP2 membrane accumulation.3 The drugs were added to LLC-PK1 cells stably expressing AQP2 and soluble yellow fluorescent protein (ssYFP).3,24 Incubation with EGFR inhibitors caused a significant increase in ssYFP fluorescence intensity (reflecting increased exocytosis) in the cell supernatant compared with control cell supernatant (Figure 3A). A similar result was observed in VP-treated cells, our positive control.24 The effect of EGFR inhibitors on endocytosis was then quantified (Figure 3B). EGFR inhibitors significantly reduced endocytosis of extracellular Texas Red dextran by >50%. This observation is further supported by the absence of AQP2 accumulation in a perinuclear patch when cells were incubated at 20°C for 1 hour (Figure 3C). Under this cold block condition, recycling AQP2 is blocked in the perinuclear patch after endocytosis, which was observed in untreated cells (Figure 3C, arrows). An increase of patch fluorescence intensity, representing mostly AQP2 internalized from the cell surface by endocytosis, was not observed in cells treated with the endocytosis–blocking drug methyl-β-cyclodextrin (MβCD), because AQP2 is retained at the plasma membrane and not internalized (Figure 3D). A similar result is seen with erlotinib treatment. Taken together, EGFR inhibition caused an increase in exocytosis and a reduction in endocytosis, which results in increased AQP2 membrane accumulation. Erlotinib increases exocytosis and reduces endocytosis in LLC-PK1 cells. (A) Gefitinib and erlotinib caused an increase of exocytosis of ssYFP in LLC-PK1 cells stably expressing ssYFP.24 Cells treated with VP served as positive controls. (B) Both EGFR inhibitors reduced endocytosis of Texas Red dextran in LLC-AQP2 cells, and cells treated with MβCD were used as a positive control (mean±SEM; n=5 [endocytosis]; n=4 [exocytosis]). *P<0.05 versus control. (C) The trafficking of AQP2 was cold blocked by incubation at 20°C for 60 minutes after incubation with inhibitors. Under control conditions, AQP2 accumulated in a very bright and tight perinuclear patch (arrows). This accumulation was significantly reduced in cells treated with erlotinib (Erl), and AQP2 remained mainly at the cell surface. A similar result was observed when cells were treated with MβCD, an endocytosis blocker. (D) Quantification of the patch intensity during the cold block was performed, and each bar represents the mean±SEM of three independent experiments performed in triplicate. Data were analyzed by t test. Scale bar, 10 μM. *P<0.05 versus control. The intracellular cAMP and cGMP levels in cells treated with EGFR inhibitors were evaluated (Figure 4). Using ELISA assays, we found that VP increased the level of intracellular cAMP 100 times more than untreated LLC-AQP2 cells, whereas EGFR inhibitors produced no detectable increase in intracellular cAMP level (Figure 4A). A similar result was obtained with cGMP, where incubation with sodium nitroprusside increased intracellular cGMP levels 25 times over controls, whereas EGFR inhibitors did not affect the intracellular cGMP signal (Figure 4B). These results suggest that the AQP2 membrane accumulation caused by EGFR inhibitors is cAMP and cGMP independent. EGFR inhibitors do not affect intracellular levels of cAMP and cGMP. LLC-AQP2 cells were incubated for 30 minutes with EGFR inhibitors (erlotinib or gefitinib; black bars). After incubation, the cells were solubilized, and supernatants were used to measure intracellular (A) cAMP and (B) cGMP using commercial ELISA assays. Incubation for 10 minutes with VP (10 nM) or sodium nitroprusside (SNP; striped bars) was performed as a positive control for cAMP or cGMP ELISA assays, respectively. P values were assessed by using the one–way ANOVA Tukey test. Each bar represents the mean±SEM of three independent experiments performed in triplicate (n=3). LVP, lysine-vasopressin. *P<0.001 versus control; #P<0.001 versus VP or SNP. The effect of erlotinib on AQP2 trafficking is Ser-256 phosphorylation dependent. (A) Western blots using specific phospho–AQP2 antibodies were performed on lysates from LLC-AQP2 cells treated with increasing amounts of erlotinib. Quantification is shown in B. (B) The phosphoserine band intensities were normalized by their respective total AQP2 loading controls (mean±SD; n=4). The data were analyzed using a two–way ANOVA Bonferroni post–test; pS256 and pS269 were increased by erlotinib, and pS261 was reduced (*P<0.05). The role of Ser-256 phosphorylation was also investigated using the LLC-AQP2 (S256A) mutant cell line. (C, upper panel) The VP–insensitive AQP2 mutant was not accumulated at the membrane when treated with VP or erlotinib (Erl). (C, lower panel) The role of Ser-261 was also studied using the LLC-AQP2 (S261D) mutant cell line. When treated with VP or Erl, there was an accumulation of this AQP2 mutant at the membrane. These results are representative of three independent experiments. Con, control. Scale bar, 10 μM. The relationship between erlotinib and the cAMP-dependent PKA was studied (Figure 6). AQP2 membrane accumulation produced by erlotinib was inhibited in cells pretreated with H89, an inhibitor that affects PKA and other kinases.27 However, the erlotinib effect was not inhibited by PKi, a selective PKA inhibitor. In contrast, both H89 and PKi completely abolished the effect of VP–induced AQP2 membrane accumulation (Figure 6, A and B). The role of PKA in erlotinib–induced AQP2 trafficking was further studied using a PKA activity assay. PKA activity increased with VP but not erlotinib (Figure 6C). This result was further supported by the observation that erlotinib did not result in phosphorylation of the PKA substrate cAMP response element binding protein (CREB),28 whereas CREB was phosphorylated upon VP treatment in a dose-dependent manner (Figure 6, D and E). These results suggest that erlotinib does not use the cAMP/PKA signaling pathway to induce AQP2 membrane accumulation. The effect of erlotinib on AQP2 is inhibited by H89 but not by PKi, a selective PKA inhibitor. LLC-PK1 cells were pretreated with H89 (30 μM) or PKi (10 μM). After 30 minutes, the cells were treated with either VP (10 nM) for 10 minutes or erlotinib (Erl) for 30 minutes. The cells were stained and analyzed using confocal microscopy. (A) AQP2 membrane accumulation occurred after Erl treatment, despite pretreatment with PKi, suggesting that the effect of Erl is PKA independent. These images are representative of three independent experiments, and quantification of AQP2 fluorescence shows the average of three experiments (mean±SEM). Scale bar, 10 μM. (B) The data were analyzed using the one–way ANOVA Tukey test. **P<0.01 compared with control; #P<0.001 compared with VP; &P<0.01 compared with Erl. (C) PKA activity was analyzed in cells treated with VP or Erl. This result is an average of three independent experiments performed in triplicate (mean±SEM). **P<0.01 compared with control (CT); #P<0.01 compared with VP. (D) Western blot analysis of cAMP response element binding protein phosphorylation (pCREB) showed that VP increased phosphorylation of CREB in a dose-dependent manner, whereas Erl had no effect. (E) The calculation was done as percentage of band intensity in relation to total cAMP response element binding protein (tCREB). These results are representative of four independent experiments (mean±SEM; n=4). *P<0.05 compared with control by one–way ANOVA Tukey test; ***P<0.001 compared with control by one–way ANOVA Tukey test; #P<0.001 compared with VP by two–way ANOVA Bonferroni post–test. Our study thus far has shown that EGFR inhibition induces AQP2 accumulation by increasing phosphorylation of AQP2 at Ser-256. Therefore, we determined whether EGF itself decreases phosphorylation of AQP2 by VP (Figure 7). We incubated cells with EGF (5 nM) for 10 minutes before VP administration, and we used cells incubated with VP alone as a positive control. We collected cell lysates at 5, 15, 30, and 60 minutes after VP incubation for Western blot analyses using phosphospecific antibody for Ser-256. EGF significantly inhibited phosphorylation of Ser-256 at 5, 15, and 30 minutes when coincubated with VP. At 60 minutes, the effect of VP on AQP2 was decreasing in addition to the inhibitory effect of EGF (Figure 7A). EGF alone tended to decrease AQP2 phosphorylation at Ser-256 at 10 minutes with recovery at 30–60 minutes, but these results did not reach statistical significance (Figure 7B). Nonetheless, at higher concentration, EGF decreased AQP2 phosphorylation (Figure 7C). The presence of a tonic inhibitory effect of EGF on AQP2 phosphorylation is consistent with the results described above showing that EGFR inhibition increases AQP2 phosphorylation and thus, membrane accumulation. VP–induced AQP2 Ser-256 phosphorylation is inhibited by EGF. (A) LLC-PK1 cells were incubated with VP (10 nM) alone (dotted line) or coincubated with VP and EGF (5 nM; solid line) for several time periods. Phosphorylation of serine 256 was analyzed by Western blot and quantified. Data were analyzed using two–way ANOVA Bonferroni post–tests (mean±SD; n=4). EGF (5 nM) significantly decreased VP–induced Ser-256 phosphorylation of AQP2. CT, control; LVP, lysine-vasopressin. *P<0.05 compared with LVP alone; **P<0.01 compared with LVP alone. (B) EGF (5 nM) alone did not affect AQP2 S256 phosphorylation significantly after 60 minutes in LLCPK-1 cells (n=5), but (C) the effect was dose dependent. These results are the average of at least three independent experiments, and they are shown here as means±SEMs (n=3). *P<0.05 (one–way ANOVA Tukey test). NDI represents a decrease in urinary concentrating ability that results from resistance to VP. In adults, the most common cause of NDI is lithium, and it is estimated that 5 in 1000 of the Western population currently take lithium.29 In addition to bipolar disorder, lithium is sometimes used off label for major depression30–32 and schizoaffective disorder,33,34 and it is currently under investigation for post–traumatic stress disorder35 and Alzheimer disease.36 Of all patients taking lithium, up to 55% of the patients report various degrees of NDI, requiring them to make major lifestyle modifications, including continuous access to water and frequent voiding to avoid hydronephrosis and bladder dilation/dysfunction.10 This complication can significantly affect quality of life and add substantial burdens to these psychologically compromised populations. For years, the mainstay of treatment for NDI, including lithium-induced NDI, has been low–salt, low–protein diet; diuretics, including thiazide and amiloride43–47; and NSAIDs, such as indomethacin,45,48,49 which are difficult to maintain on a long-term basis and may cause electrolyte disarray, gastrointestinal disturbances, and renal insufficiency. Therefore, additional strategies have been developed in an attempt to increase trafficking, abundance, and accumulation of AQP2 on the apical membrane of collecting tubules to promote water reabsorption.50 Some of these potential therapeutic strategies included activating the cAMP pathway using calcitonin to increase cAMP levels via GαS activation,11 stimulating the nitric oxide/cGMP pathway with the phosphodiesterase inhibitor sildenafil,13,51 affecting the PGE2 pathway using the COX-2 inhibitor celecoxib,52,53 or modulating the actin cytoskeleton network with statins to decrease AQP2 endocytosis.9,10 These approaches seem promising, but perhaps because lithium exerts such a complex effect on AQP2 trafficking and collecting duct morphology, none of them have yet been shown to provide sustainable benefits in patients. In our previous study, we used high-throughput screening for small molecules that can bypass the above pathways and induce AQP2 membrane accumulation. We identified AG-490, a combined JAK-2 and EGFR inhibitor,16 as a potential compound of interest. In this study, we further dissected the dual actions of AG-490 and found that EGFR inhibition alone increased AQP2 accumulation at the plasma membrane, whereas JAK/STAT inhibition alone did not. On the basis of this result, we administered an EGFR inhibitor erlotinib to our lithium–induced NDI mice and found that, by day 3, polyuria and hypo-osmotic urine induced by lithium were attenuated and that increased cell surface accumulation of AQP2 was observed in principal cells of their collecting ducts. The effect of erlotinib on attenuating lithium-induced NDI was replicated in separate experiments with 4 days of erlotinib treatment and also observed in a different strain of mice (Supplemental Material). These data are in accord with a recent study by Bou Matar et al.54 When erlotinib was administered to doxorubin–induced nephrotic rats, the reduction of AQP2 expression associated with doxorubin exposure was reversed completely in inner medullary tip tissue, and this preserved AQP2 expression paralleled improved water handling with reduced urine output. Despite this finding in animals, the mechanism by which erlotinib affects AQP2 trafficking remained elusive. Using LLC-PK1 cells stably expressing AQP2, we found that erlotinib increases exocytosis and decreases endocytosis, resulting in accumulation of AQP2 at the plasma membrane. A similar synergism in the AQP2 vesicular recycling pathway is observed in the presence of VP.3,55–57 The destination and kinetics of these AQP2-bearing vesicles are dictated by the AQP2 phosphorylation state, such that phosphorylation of Ser-256 is essential for AQP2 membrane accumulation, largely by inhibiting endocytosis.55,58–60 Ser-269 also plays a role in membrane retention of AQP2,61 and Ser-261 may be important for ubiquitination and internalization AQP2,62 although some studies were unable to dissect out a clear effect of the Ser-261 residue on AQP2 trafficking.4,26,63 Erlotinib administration resulted in a pattern of phosphorylation similar to that induced by VP. The role of phosphorylation of Ser-256 by erlotinib was further confirmed in the AQP2 S256A mutant cells, in which erlotinib did not cause AQP2 membrane expression, but in mutant S261D cells, erlotinib was still able to exert its effect on AQP2. Taken together, these results indicate that Ser-256 but not Ser-261 is critical for AQP2 erlotinib–mediated membrane accumulation. Although similar end points are induced by erlotinib and VP, we found that the action of erlotinib is cAMP and PKA independent. Bypassing the canonical cAMP/PKA pathway suggests that an unidentified kinase is activated by EGFR inhibition to phosphorylate AQP2. Several studies have predicted that Ser-256 can be phosphorylated by several kinases other than PKA,25,64 and our study shows that it is not PKG, because cGMP was also not increased by erlotinib. Because EGFR inhibition blocks multiple signaling pathways and kinases downstream of the receptor, more studies are needed to identify this kinase. Consistent with previous work, we found that EGF tonically inhibited the effect of VP, and we show here that it exerts its effect by decreasing phosphorylation of Ser-256. The kidney is a major site of EGF synthesis, and EGF is critical for renal organogenesis and many cellular functions, such as proliferation, migration, growth, and differentiation.65–67 EGFRs are localized along the nephron,65 and they play key roles in normal kidney physiology and pathogenesis. For example, EGF is important in renal cyst formation,68 repair of AKI,67 progression in CKD,67,69 and development of kidney carcinoma.70–72 At the cellular level, EGF is especially critical in renal sodium69,73 and magnesium homeostasis.74,75 Therefore, it is not surprising that EGF also has a role in fluid transport. Interestingly, although 5 nM EGF alone did not decrease the baseline phosphorylation of AQP2 at Ser-256, we did see a decrease of AQP2 phosphorylation that became significant when EGF was used at 10 times its IC50. However, EGF at its IC50 (5 nM) was able to significantly attenuate the effect of VP on AQP2 phosphorylation. Physiologically, there may be situations that cause transient regional increases of serum EGF levels or upregulation of EGFR, such as in the early recovery phase of ischemic acute tubular necrosis,76–79 and this crosstalk between EGF and VP may help explain the brisk water diuresis that could sometimes be observed in such conditions. 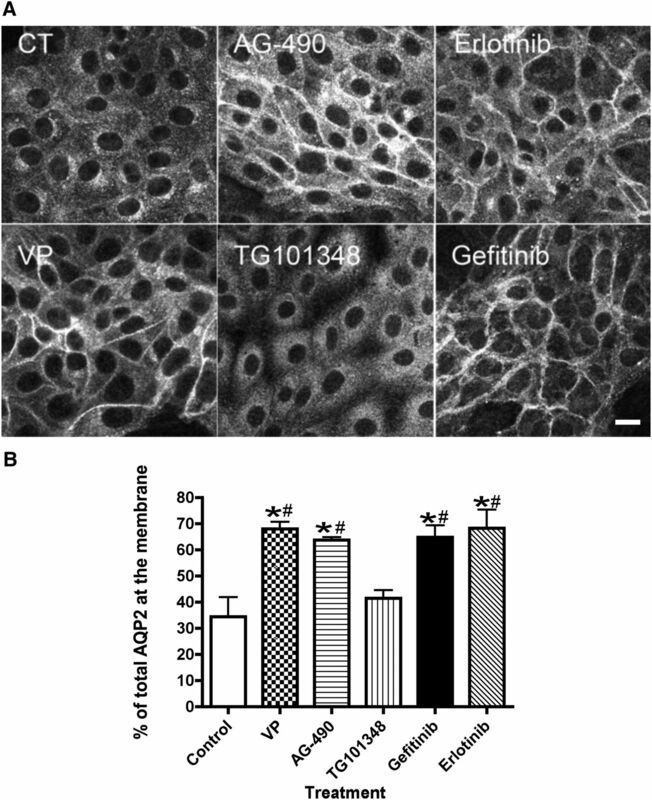 A similar result was reported by Breyer et al.80 when rabbit collecting tubules were perfused with EGF during stimulation by VP; a 50% inhibition by EGF of the hydraulic conductivity induced by VP in control tubules was noted. Zhang et al.,81 however, found that targeted inactivation of EGFR in renal collecting ducts induced moderate polyuria and reduced urine-concentrating ability, despite VP stimulation and normal AQP2 expression. This defect of water reabsorption in their study can, however, be explained by the significant anatomic abnormalities observed in these knockout mice. They all exhibited medullary hypoplasia, atrophic papillae, dilation of the renal pelvis, and immature renal collecting ducts that would affect water reabsorption. Therefore, to further study the interaction between EGF and VP signaling, an EGFR–inducible knockout model that does not cause kidney malformation is needed. To date, there is no independent pathway other than EGF signaling known to be inhibitory to AQP2 trafficking and that directly decreases the phosphorylation of AQP2 at Ser-256. The availability of FDA–approved EGFR inhibitors, such as erlotinib and gefitinib, provides an exciting opportunity to translate these results to patients. It is likely that a combination of therapies will be necessary to activate AQP2 trafficking or increase AQP2 expression along with relief of inhibition with EGFR inhibitors to optimize the success of NDI treatment. Additional studies are now needed to find the unidentified kinase activated by EGFR inhibition and investigate the underlying pathways downstream of EGF signaling that are important for AQP2 trafficking to tailor a successful therapy for NDI. LLC-PK1 cells expressing c-myc–tagged AQP2, AQP2 S256A, and AQP2 S261D mutations were grown in DMEM, 10% FBS, and 1 mg/ml Geneticin as previously described.2–4 Cells were tested to be mycoplasma free using DAPI staining with Vectashield/Dapi (Vector Laboratories, Burlingame, CA) diluted 2:1 in 0.1 M Tris-HCl (pH 8.0). Before treatment, cells were rinsed with PBS and then starved 1 hour in DMEM without FBS before treatment. Drugs were added directly to the medium to reach their final concentrations. Cells were treated for 30 minutes with AG-490 (16 μM; Selleck Chemical LLC, Houston, TX), TG-101348 (0.2 μM; Selleck Chemical LLC), two EGFR inhibitors (gefitinib [1 μM] and erlotinib [0.2 and 2 μM]; Cayman Chemicals, Ann Arbor, MI), H89 (30 μM; Tocris Bioscience, Bristol, United Kingdom), PKi 14–22 amide (myristoylated; 10 μM; Tocris Bioscience), and MβCD (10 mM; Sigma-Aldrich, St. Louis, MO). Ten minutes of VP treatment (10 nM; Sigma-Aldrich), EGF (0.5, 5, and 50 nM; Life Technologies, Grand Island, NY), and forskolin treatment (10 μM; Tocris Bioscience) were used as positive controls. Animal experiments were approved by the Massachusetts General Hospital Institutional Committee on Research Animal Care in accordance with the National Institutes of Health’s (NIH) Guide for the Care and Use of Laboratory Animals. Two C57BL/6 mice (Charles River Laboratories, Wilmington, MA) were housed in each metabolic cage (Tecniplast, West Chester, PA). The mice were maintained in a temperature-controlled room regulated on a 12-hour light-dark cycle with free access to water. Mice were fed with normal chow (LabDiet 5053; TestDiet, Richmond, IN) and acclimated 7 days in cages before the beginning of the treatment. Urine samples were harvested from acclimatization day 4. On the seventh day, all 16 mice were fed with chow containing lithium (LabDiet 5053 with 0.296% lithium carbonate; TestDiet). Eight mice received simultaneously erlotinib (100 mg/kg) by oral gavage (in 0.5% [wt/vol] methylcellulose/0.4% [vol/vol] Tween-80). Controls were gavaged with solution containing no erlotinib. Serum was obtained before initiation and at the conclusion of the experiment, and the gavage treatment was given for 5 days with daily collection of urine and feces. Similar experiments were performed with 12 C57BL/6 mice for 4 days of erlotinib treatment and 5 days of treatment for 16 BALB/c mice. Urine and blood osmolality were measured using an osmometer (Wescor, Logan, UT). Serum electrolytes were analyzed at the Massachusetts General Hospital Core Facility. At the termination of treatment, animals were euthanized, and one kidney was harvested for Western blot analyses, whereas the other was fixed for immunocytochemistry as described below. Mice were anesthetized with 2% isofluorane inhalation. One kidney was clamped and harvested. Kidney tissues were frozen in nitrogen until used. Mice were perfused through the abdominal aorta until kidneys were cleared of blood. Mice were perfused with periodate-lysine paraformaldehyde fixative and then immersed in fixative overnight. Tissues were then rinsed five times in PBS (10 mM sodium phosphate buffer containing 0.9% NaCl, pH 7.4), cryoprotected in PBS containing 30% sucrose, and then covered with OCT compound 4583 (Tissue-Tek; Miles Inc., Elkhart, IN). Cryosections (5-μm thick) were cut using a Leica 3050S Microtome (Leica Microsystems, Buffalo Grove, IL). Sections were picked up on Fisher Superfrost Plus Slides (Thermo Fisher Scientific, Waltham, MA) and stored at 4°C before immunofluorescence staining. After rehydration in PBS for 20 minutes, sections were incubated in PBS containing 1% BSA for 10 minutes to block nonspecific staining. Sections were then incubated with goat anti–AQP2 antibody (0.2 μg/ml) followed by three washes in PBS. Sections were then incubated with donkey anti–goat IgG conjugated to FITC or CY3 (25 and 1.9 μg/ml, respectively; Jackson ImmunoResearch Laboratories, West Grove, PA) for 1 hour at room temperature and rinsed three times in PBS. Sections were then mounted in Vectashield (Vector Laboratories, Burlingame, CA) diluted 2:1 in 0.1 M Tris-HCl (pH 8.0) and examined using a Nikon A1R Confocal Laser–Scanning Microscope (Nikon, Tokyo, Japan). Final images were imported into Adobe Photoshop (Adobe Systems, Inc., San Jose, CA) as TIFF files. The immunofluorescence assays were performed as previously described.16 LLC-PK1 cells expressing AQP2 constructs were cultured on glass coverslips. After treatment, cells were fixed in 4% paraformaldehyde containing 5% sucrose. Cells were permeabilized with Triton X-100 (Sigma-Aldrich) and blocked in 1% BSA. AQP2 was detected using mouse anti-c-myc and a secondary anti–mouse IgG conjugated to FITC (25 μg/ml; Jackson ImmunoResearch Laboratories). Images were acquired on a Nikon A1R Confocal Microscope or a Nikon 80i Microscope. The exocytosis and endocytosis assays were described in detail in previous studies.24,82 Exocytosis was quantified in LLC-PK1 cells stably expressing both c-myc–tagged AQP2 and the ssYFP (LLC-AQP2-ssYFP cells).24 Cells were grown in 96-well plates (Corning, Corning, NY) until 80% confluency. The cells were starved 1 hour in 250 μl HBSS (Invitrogen, Carlsbad, CA) supplemented with 20 mM HEPES and 2 g/L glucose, and then drugs were added as described above. At the end of the treatment, 150 μl medium was transferred from each well to a black half–area 96–well plate. Soon after collection, the ssYFP fluorescence in each well was analyzed using a multimode plate reader (model DTX880; Beckman Coulter, Inc., Fullerton, CA). The values represent at least five independent experiments, with results at each time point measured in triplicate. Background fluorescence values were obtained from wells containing DMEM only, and fluorescence values are reported as a ratio of each background- and zero-subtracted value. The endocytosis assay was performed in LLC-PK1 cells grown on glass coverslips until 80% confluence. Cells were starved in serum-free DMEM 1 hour before the experiment. MβCD was used as a positive control to block endocytosis. Dialyzed Texas Red dextran was added to a final concentration of 1.5 mg/ml 10 minutes before the end of the treatment. After treatment, cells were washed three times with cold PBS to remove cell surface Texas Red dextran. Cells were lysed by 150 μl RIPA buffer and protease inhibitor cocktail (complete mini; Roche Diagnostics, Indianapolis, IN). The plate was shaken for 20 minutes on ice, and then, cell lysates were collected and centrifuged at 400×g; 100 μl supernatants were then transferred to black 96–well plates. Fluorescence in each well was read on a DTX880 Multimode Plate Reader (Beckman Coulter, Inc.). Western blotting was performed as previously described.83 Briefly, LLC-AQP2 cells were grown on six-well plates for 2 days. After 1 hour of serum starvation, cells were incubated with erlotinib at 0.2 and 2 μM for 30 minutes. Here, cells were lysed in RIPA buffer supplemented with a protease inhibitor cocktail and phosphatase inhibitors NaF (1 mM), EDTA (5 mM), and sodium orthovanadate (1 mM). The lysates were rotated for 30 minutes at 4°C and centrifuged for 10 minutes at 6000×g. Protein concentrations were determined using the BCA Kit according to the manufacturer (Pierce, Rockford, IL) with BSA as a standard. Solubilized proteins were mixed with NuPage SDS sample buffer and incubated at 70°C for 10 minutes. Samples were run on a NuPage 4%–12% Bis-Tris Gel (Invitrogen) and transferred on to Sequi-Blot PVDF membranes (Bio-Rad, Hercules, CA). The membranes were incubated in 5% nonfat milk for 1 hour and then washed twice with 0.1% Tris-buffered saline and Tween-20. The membranes were incubated overnight with primary antibodies. Primary antibodies were anti-AQP2 (C-17; Santa Cruz Biotechnology), antiphospho-AQP2 (pS261; Symansis, Temecula, CA), and antiphospho-AQP2 (pS256; Abcam, Inc., Cambridge, MA). The membranes were then washed five times in Tris-buffered saline and Tween-20 before the second antibody incubation with horseradish peroxidase–conjugated antibodies (Jackson ImmunoResearch Laboratories). Anti-AQP2 pS269 (Symansis) was detected using AMDEX goat anti–rabbit IgG horseradish peroxidase (GE Healthcare, Waukesha, WI). Signals were visualized using enhanced chemiluminescence Western Lightning ECL (Amersham, Arlington Heights, IL) and exposed to Hyblot ES Film (Denville Scientific, Metuchen, NJ). After visualization, membranes were stripped using Western blot stripping buffer (Thermo Fisher Scientific, Rockford, IL) for 10 minutes according to the manufacturer’s instructions. Membranes were subsequently stained to detect various phosphoserines—269, 261, and 256—and finally, total AQP2. Intensities of phosphoproteins were analyzed by ImageJ (NIH, Bethesda, MD), and intensities were corrected according to the amount of total AQP2 on the same membrane. The cAMP and cGMP levels in cells treated with drugs were analyzed using the BioTrack EIA System (GE Healthcare) as previously described.21 Here, cells were starved 2 hours before drug administration. VP (10 nM) and nitroprusside (1 mM) were used as a positive control. Results were measured using the DTX880 Multimode Plate Reader (Beckman Coulter, Inc.). Both assays were performed three times independently, and each treatment was done in triplicate. The effect of erlotinib and VP on PKA activity was analyzed using the PKA Kinase Activity ELISA Kit (Enzo Life Sciences, Farmingdale, NY). The assay was performed according to the manufacturer’s protocol (Enzo Life Sciences). In brief, the cells were starved for 1 hour before treatment. Cells were incubated at 37°C with either VP (10 minutes) or 2 μM erlotinib (30 minutes). After incubation, the cells were lysed in lysis buffer made according to the manufacturer’s protocol. After protein determination using the BCA assay, 0.5 μg crude protein in 30 μl of lysate was used to determine PKA activity. ELISA results were measured using the DTX880 Multimode Plate Reader (Beckman Coulter, Inc.). Each condition was performed in triplicate, and results are averaged from four independent experiments. PKA activity was also studied by Western blot analysis. Phosphorylation of serine 133 of CREB, a substrate of PKA, was quantified; 25 μg protein was loaded onto the gel. Western blot was performed as described above. Phospho-CREB was detected with 2 μg/μL of antibody (Santa Cruz Biotechnology). After visualization, membranes were stripped using Western blot stripping buffer. Membranes were subsequently stained to detect total CREB. Intensities of the phosphoproteins were analyzed by ImageJ (NIH), and they were corrected according to the total amount of CREB. The accumulation of plasma membrane AQP2 was quantified as described.16 In brief, after AQP2 labeling, the cell membranes were costained with rhodamine–conjugated wheat germ agglutinin (2 μg/L; Lectin Kit; Vector Laboratories) for 10 minutes. Cells were washed three times with PBS and mounted with Vectashield with DAPI to costain the nucleus. The quantification of AQP2 was performed under blinded conditions. The fluorescence channel corresponding to the AQP2 staining was shut off, and the membrane and the cytoplasmic areas were determined by fluorescence labeling performed using the rhodamine–conjugated wheat germ agglutinin signal. In this way, we determined a region of interest corresponding to the membrane, cytoplasm, and nucleus of each cell. The fluorescence in the AQP2 channel was then evaluated in each predetermined region of interest and corrected for nonspecific labeling by subtraction of the background fluorescence observed in the nucleus. The mean fluorescence intensity of the plasma membrane area was determined using 30 cells from five different images of each sample taken and quantified using Volocity software (PerkinElmer, Waltham, MA). Quantification of fluorescence intensity in labeled cells and tissues was performed using Volocity 3D Image Analysis software. Quantification of Western blot band intensity was performed using ImageJ (NIH). Data are expressed as means±SEMs. The one–way ANOVA Tukey test or two-way ANOVA with Bonferroni correction was performing using PRISM software. A t test was performed when appropriate using Excel software. Differences were considered to be significant at P values <0.05. P.W.C. was supported by the National Institutes of Health (NIH) Training grant T32 grant 5T32DK007540-29. N.N. was supported by a grant from the Strategic Young Researcher Overseas Visits Program for Accelerating Brain Circulation from the Japan Society for the Promotion of Science. L.U. was supported by the Kolff student fellowship abroad grant of the Dutch Kidney Foundation. NIH grants DK075940 and DK092619 and a Massachusetts General Hospital (MGH) /Executive Committee on Research (ECOR) interim support fund supported H.A.J.L. This work was supported by NIH grant DK096586 (to D.B.). The Nikon A1R confocal in the Program in Membrane Biology Microscopy Core was purchased using an NIH Shared Instrumentation grant S10 RR031563-01 (to D.B.). R.B. was supported by an MGH/ECOR interim support fund and University of Baltimore Maryland Polycystic Kidney Disease Core Center grant P30 DK090868. Additional support for the Program in Membrane Biology Microscopy Core comes from Boston Area Diabetes and Endocrinology Research Center grant DK57521 and MGH Center for the Study of Inflammatory Bowel Disease grant DK43351. P.W.C. and N.N. are equally first co-authors. This article contains supplemental material online at http://jasn.asnjournals.org/lookup/suppl/doi:10.1681/ASN.2015080903/-/DCSupplemental.